Carriage Wheels, Wagon Wheels, Cannon Wheels, Yesterdays Products, Handmade In The USA Today. We make Carriage Wheels, Buggy Wheels, Steel Wagon Wheels, Wagon Wheels, Wooden Wagon Wheels, Cannon Wheels, Custom Wagon Wheels, and Decorative Wagon Wheels. Yesterdays Handmade Wagon Wheels, Handmade in the USA Today. For over 50 years Wagon Wheels and Wagons is what we do. That is why we sell more Wagon Wheels and Wagons than anyone else. We are a family owned and operated business, located in the Appalachian Mountains of Eastern Kentucky and Eastern Pennsylvania. You will find our wagon wheels In the movies (Paramount, DreamWorks, Warner Brothers Pictures, Disney, Turner Films), on TV (Trading Places, Into The West, Myth Busters), on the beach at resorts, in university theater groups and major theme parks (Disney, Six Flags, Silver Dollar City, Kennywood, Tweetsie Rail Road) across America. Click Image To View Wood Carriage Wheel Information And Larger Image. Dimensions:16 spokes, 1 1/4 wide, 1 1/5" thick, powder coated steel hub, 1" bore in hub, hub is 7 1/2" long, and 5 1/4" diameter and steel rims, add Rubber for $32.00, Base Price: $169.95. Click Image To View Wood Carriage Wheel Information And Larger Image. Dimensions:16 spokes, 1 1/4 wide, 1 1/5" thick, powder coated steel hub, 1" bore in hub, hub is 7 1/2" long, and 5 1/4" diameter and steel rims, add Rubber for $32.00, Base Price: $172.95. Click Image To View Wood Carriage Wheel Information And Larger Image. Dimensions:16 spokes, 1 1/4 wide, 1 1/5" thick, powder coated steel hub, 1" bore in hub, hub is 7 1/2" long, and 5 1/4" diameter and steel rims, add Rubber for $32.00, Base Price: $179.95. Click Image To View Wood Carriage Wheel Information And Larger Image. Dimensions:16 spokes, 1 1/4 wide, 1 1/5" thick, powder coated steel hub, 1" bore in hub, hub is 7 1/2" long, and 5 1/4" diameter and steel rims, add Rubber for $32.00, Base Price: $184.95. Carriage Wheels - Buggy Wheels, made from quality hickory wood with a powder coated metal hubs. 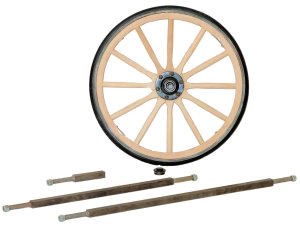 These carriage wheels are real working wheels, yet can be used for decoration; replacement carriage wheels are used on carriages, Amish buggies and buggy's around the world. These Handmade Carriage Wheels are Horse Drawn Carriage Wheels, Bearings and axles for these carriage wheels come in many different sizes and are made to the customers specifications. Wood Butter Churns - Wood Buckets, Take A Trip Back In Time.... Both adds a country accent to your home. Like all of our churns or buckets, it is a replica of old style used on the American frontier and in farm houses throughout the US. Sanded smooth white pine staves and hoops that are fastened by copper nails. Add a great country or antique accent, or unfinished, it makes a project for painting or stenciling to add your own personal touch. Wood Wheelbarrow, Handcrafted and Works in your garden or yeard, quality workmanship to insure years of service. This wheelbarrow is constructed of solid wood with steam bent wooden wheel and steel rim. The sides are removable for oversized loads or for more decorating options. Great for seasonal yard or porch decoration, fill with pumpkins and corn in the fall, fill with plants in the spring and summer, or use for general landscaping. Cannon Wheels made of hickory wood and designed to look like the civil war era cannon wheels. These wheels are extremely strong and solid, designed and dished for working cannon use. If you plan on rolling your cannon wheels around or pulling your cannon, your cannon wheels will require a bushing inserted into the hub, the price of the bushing includes truing so the wheel runs true and epoxying the bushing inside the hub. Axles are available for all of our Cannon Wheels. Butter Churn Lamp, you do not have to buy a wagon wheel chandelier to enjoy a light from yesterday with our butter churn lamps. We have a large selection of cloth shades available for all the lamps we make for the butter churn lamps to our wagon hub lamps Our butter churn lamps are made from the butter churns found in our online store, Our butter churn lamps can be used to add that rustic, country, or western decor to any room or landscape. CLICK TO VIEW ALL OF OUR WAGON WHEELS, Wooden Wagon Wheels, Steel Wagon Wheels, Cannon Wheels.